CHICAGO, Jan. 5, 2015 /PRNewswire/ -- United Airlines has expanded Wi-Fi to the first of its United Express regional aircraft, enabling more customers to stay connected in flight during their journeys. The airline will outfit more than 200 E175, E170 and CRJ700 regional jets with Gogo's ATG-4 advanced air-to-ground Wi-Fi product. By mid-2015, United expects to complete installation on nearly all these aircraft. Additionally, the company will begin providing Personal Device Entertainment on regional jets this year, offering customers hundreds of complimentary movies and television shows to view on their Wi-Fi-enabled iOS and Android devices using United's mobile app, as well as on laptop computers. "Expanding in-flight connectivity and personal device programming aligns the customer experience on our regional jets with our mainline aircraft and will enable many more of our customers to enjoy Internet access and streaming entertainment on their personal devices when traveling with us," said Tom O'Toole, United's senior vice president of marketing and loyalty and president of MileagePlus. 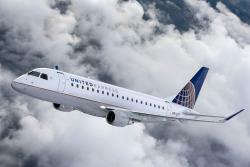 United's regional jet Wi-Fi installations begin as the airline continues to outfit its mainline fleet with Wi-Fi, which the carrier currently offers on nearly three-quarters of its domestic mainline fleet. United also operates more international aircraft with Wi-Fi than any other U.S. airline. The company has installed Personal Device Entertainment on nearly 200 mainline aircraft, including its entire Boeing 747, Airbus A319 and A320 fleets and its nine Boeing 777 aircraft that fly primarily between the continental United States and Hawaii. Upgrading premium-cabin meal service on United Express this spring by replacing snack boxes with freshly prepared food on flights that are more than 2 hours and 20 minutes, or 800 miles.